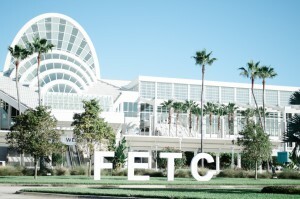 PALM BEACH GARDENS, Fla. – November 9, 2016 – The National Future of Education Technology Conference (FETC), the largest, national, independent education technology conference, today announced details of its Early Learning track, one of five targeted session tracks available at the upcoming FETC. 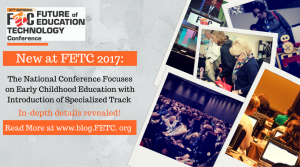 Taking place January 24 – 27, 2017, at the Orange County Convention Center in Orlando, Fla., FETC introduced the Early Learning track into the programming of the 37th annual event to better meet the needs of the conference’s audience of educators and administrators who serve young children. New research and policies on the effect of technology on early child development are raising questions for preschool and early elementary directors, administrators and teachers as they grapple with how best to integrate tech into programs for young learners. Designed for preschool and early elementary directors and administrators, curriculum designers, educators, researchers and tech directors, the Early Learning track will provide intensive workshops and hands-on sessions aimed at helping attendees develop a deeper understanding of developmentally appropriate uses of technology for children aged 3-8 years. Through the nearly 30 distinct Early Learning sessions, participants will gain insight into how and when to incorporate technology into programs for young learners. During FETC, preschool, PreK and early elementary educators will have opportunities to take a deeper dive into early learning technology topics such as incorporating technologies in developmentally appropriate ways, ensuring equitable access for students, family involvement, assessing devices and interfaces with young learners in mind, and integrating digital citizenship within learning activities. Incorporating educational technologies in playful settings while keeping content and learning in mind will be the focus throughout the sessions. The diverse and informational sessions offered at the event will provide early learning teachers and administrators with a look at existing and emerging technology, such as robotics, tablets, virtual reality, augmented reality and more. More information about the 37th National Future of Education Technology Conference, including registration details, is available at www.fetc.org or by calling toll-free 1-800-727-1227. LRP Conferences, LLC, an affiliate of LRP Publications, produces more than a dozen professional conferences and trade shows annually including: Campus Technology Conference, Ergonomics Conference & ErgoExpo, Future of Education Technology Conference (FETC), Recruiting Trends Conference, and Talent Acquisition Tech Conference. LRP Publications, founded in 1977 by Kenneth Kahn, is a broad-based media company serving business and education professionals. Specializing in the fields of education administration, education law, education technology, federal employment, human resources, workers’ compensation and disability, the company publishes hundreds of books, pamphlets, newsletters, videos and online resources on various topics including Title 1 and Special Education. Additionally, LRP publishes two industry-leading magazines: Human Resources Executive® and Risk & Insurance®, plus delivers top-quality training and professional development with eLearning, conferences and tradeshows including: HR Technology Conference & Exposition®, National Institute on Legal Issues of Educating Individuals with Disabilities®, National Workers’ Compensation and Disability Conference® & Expo and dozens more. For a complete list of LRP products, eCourses and conferences, please visit www.lrp.com.